Is Spain’s Socialist party really divided … yet again? Spain’s Socialist party (PSOE) appears to be showing cracks in the leadership’s efforts to portray party unity, following the Phoenix-like return to power last year of PSOE general secretary Pedro Sánchez after his removal in an internal party coup in 2016. Or, at least that’s how the current situation is depicted in Spain’s establishment media, which Sanchez’s leadership team says has been pushing a meme that the Socialists are in turmoil, using a steady drumbeat of stories based on anonymous sources within the party and fomenting the notion that the party is in trouble with publication of results of recent voter preference surveys by newspapers El País, La Vanguardia and others that the party leadership says are dubious. The current cracks in the PSOE veneer of unity appeared in February, when several regional party bosses who participated in the 2016 anti-Sanchez coup, among them Susana Díaz of the powerful PSOE regional affiliate party in Andalucia, failed to show for a mid-February meeting of the PSOE’s federal committee that approved a new set of party statutes, giving the rank-and-file membership greater input and centralizing ultimate decision-making power in the hands of the executive leadership team led by Sánchez. Then, the current leadership reportedly angered many in the party’s old guard when it refused to endorse former PSOE vice-secretary general and government minister Elena Valenciano to become interim head of the European Socialists’ group in the European parliament. Valencia had supported Díaz in her run against Sánchez last year and the refusal was seen by some as a petty reprisal, not to mention unwise politically – as endorsing a woman candidate to lead the European Socialists in the run-up to International Women’s Day would have undoubtedly further strengthened the PSOE’s credibility among women voters in Spain. Then last week, Sánchez was again given the cold shoulder by regional barons led by Díaz, who along with several old-guard party leaders were no-shows for the party’s Escuela de Buen Gobierno best-practices in government conference in Madrid. 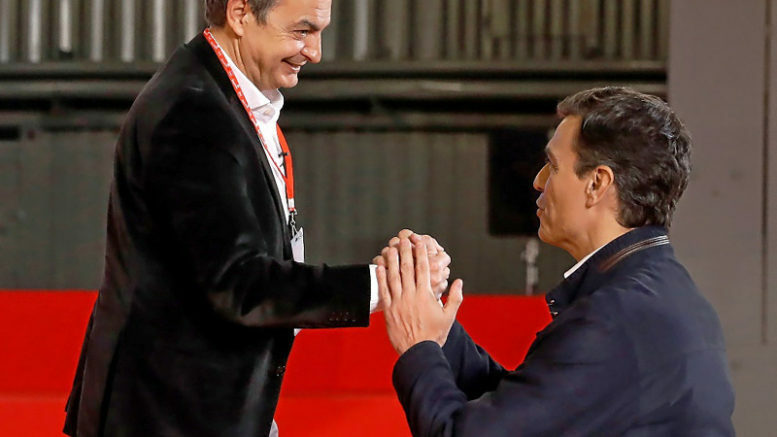 The conference was headlined by Valenciano’s old boss, former Spanish president José Luis Rodríguez Zapatero, who supported Díaz’s run for the party leadership against Sanchez last year but has since pledged loyalty to the new leadership and made a pointed call for party unity at the event. The Socialist leadership under Sánchez is now questioning the steady stream of unattributed media stories about divisions in the party, along with the sudden rise of centre-right party Ciudadanos in voter preference surveys in which the Socialists are seen to slide or stagnate. At the Escuela de Gobierno conference last week, the head of studies and surveys for the Socialists, José Félix Tezanos, singled out recent polls numbers published by various media outlets as amounting to “political advertising” that recall the decade of the 1990s, when false survey numbers were circulated by some media outlets to promote the successful presidential aspirations of then-candidate José María Aznar of the Partido Popular (PP).